When I was a kid, although not a picky eater, I remember thinking tomatoes were kind of gross. I wasn't adamantly against them, if they were on a burger, I would just eat them, but I wasn't all that crazy about them. Now, as an adult, I crave tomato season from the moment it ends until its return the next summer. This year I've been making anything and everything I can with these gems. My favorite though, this super simple tomato sauce recipe. It's insanely easy and will make you forget about any grocery store jar you've ever picked up. Heat a medium cast iron skillet over medium heat and place the whole tomatoes on the hot skillet. 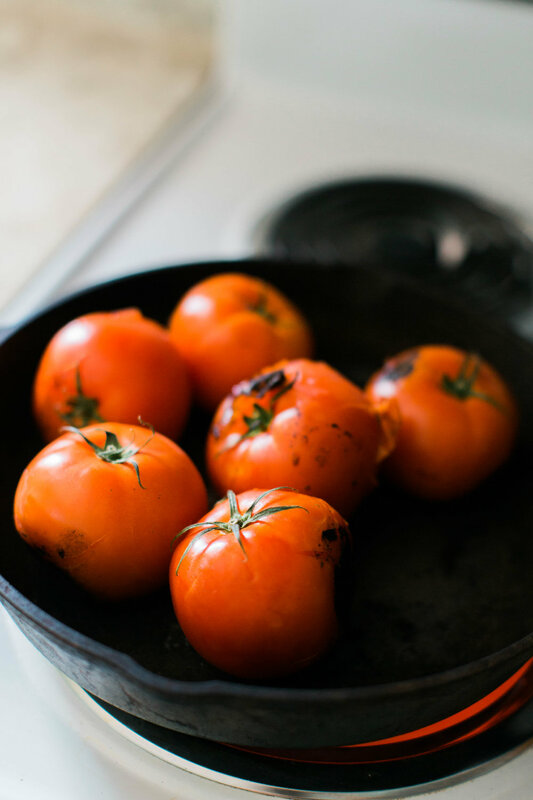 Cook the tomatoes on the skillet, rotating every few minutes to ensure all sides are equally charred, until the skins start to break open on the tomatoes. Remove the tomatoes from the heat and remove the stems. Heat the olive oil in a large pot and then add in the onion, garlic, and a pinch of salt and cook for about 3 minutes. Add the tomatoes to the pot and use a masher (or a wooden spoon) to mash to them. Stir, then add the balsamic vinegar, honey, and red pepper flakes. Simmer for 20-25 minutes. Add more salt and pepper to taste. Place in a food processor and blend until smooth. Store in an airtight jar and place in the fridge for up to a week or in the freezer for up to a month.